The Royal Army fielded at Sedgemoor in 1685 was modest in size but when compared to its opponents, infinitely more professional and experienced. 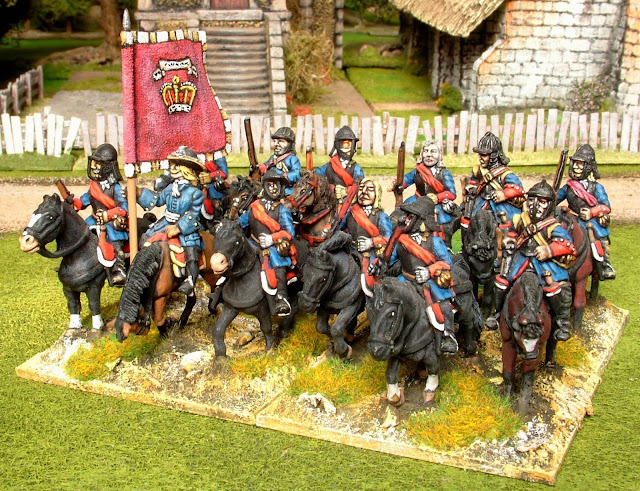 It contained two regiments of Horse and one of dragoons and six battalions of infantry supported by artillery. Several of the regiments were fresh from foreign service in Tangier where they saw continuous action in a hostile environment. Others had served at sea as detachments of marines with the navy. Many of the officers had foreign service experience with the Dutch, French or Imperial armies and will have seen action in many pitch battles and sieges. This unit was cobbled together specifically for Historicon several years ago and now lives in the USA. This unit has always served as Le Roi du Angleterre in the French army but is in fact the Life Guards. The King's Life Guard of Horse was the most prestigious unit in the army being composed of noblemen, gentlemen and their retinues. It would have appeared somewhat ostentatious compared to other regiments. The two versions shown here are reflections of what figures were available at the time of creation. I still own the unit in the second shot which occasionally gets an outing but has over the years, seen much service. 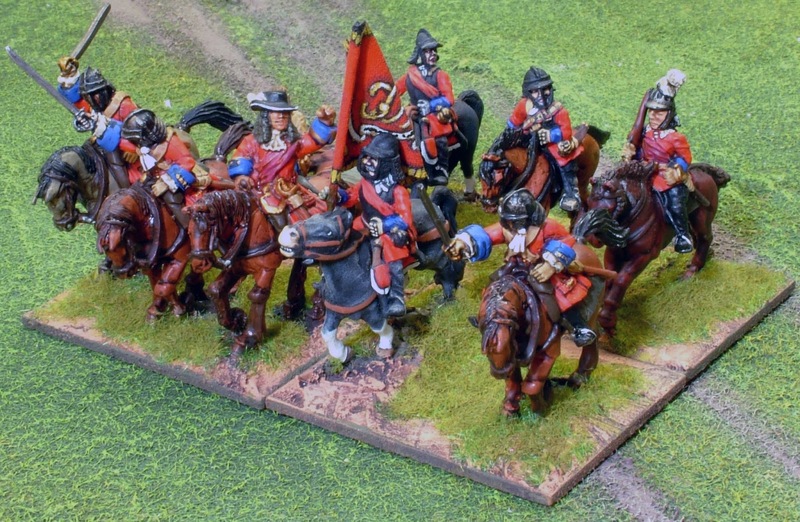 The Royal Regiment of Horse - Oxford's Blews. My original effort was painted nearly 20 years ago and I used ECW figures. No other miniatures were available at the time. It served well but went to a new home I think maybe in Holland several years ago. 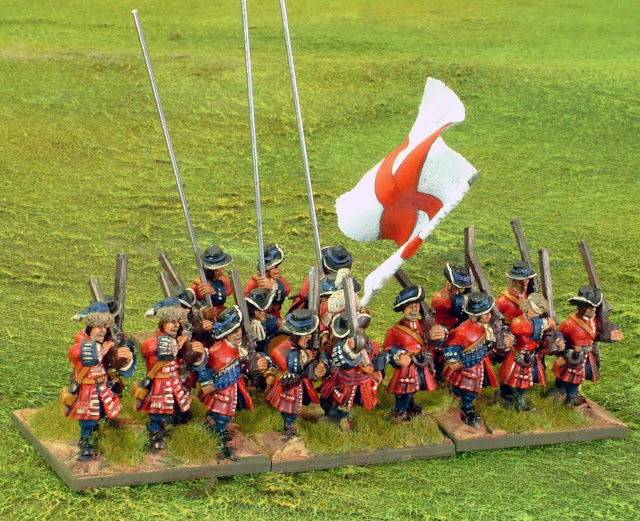 The Royal Regiment of Dragoons probably fought both mounted and dismounted during the Sedgemoor campaign. 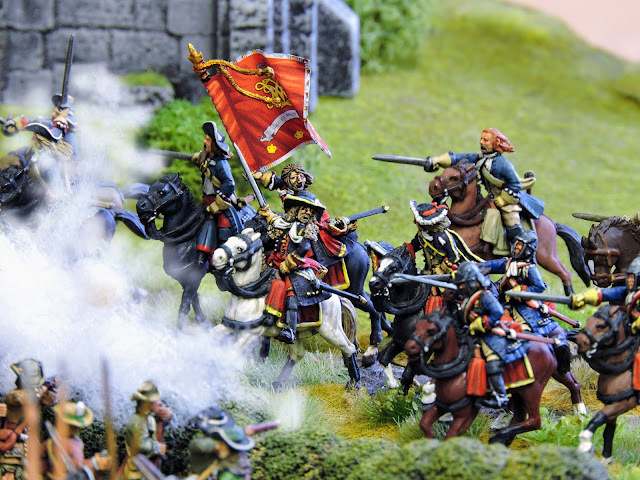 The photo shows dragoon troopers dismounted and skirmishing. 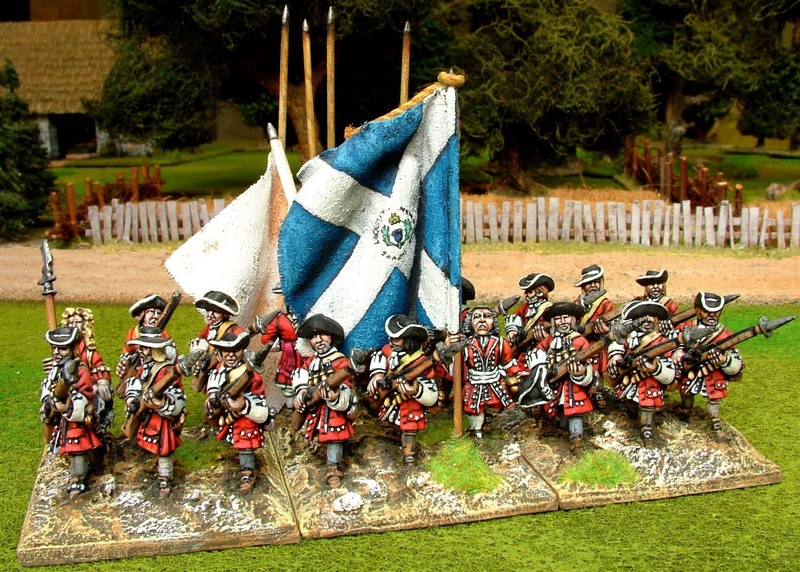 Yes another incarnation of the Guards which was sold a few years ago. 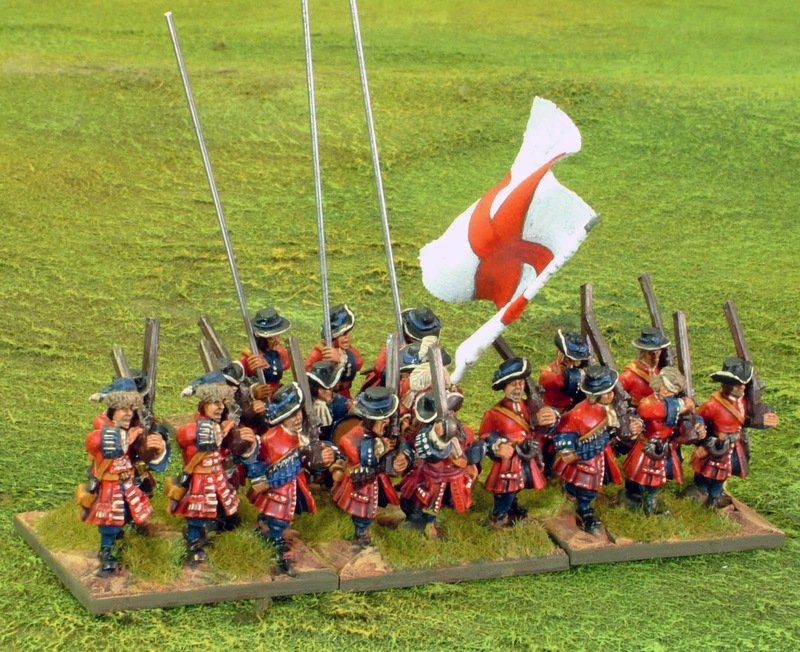 The King's Foot Guards had two battalions present at the battle. 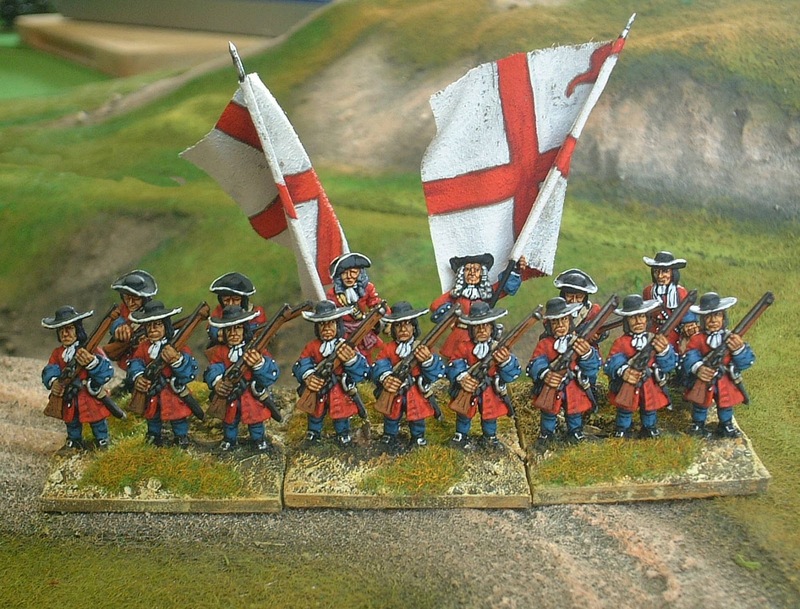 I have painted this unit in various guises about six or seven times over the years. Two of the versions above now belong in other people's collections. Army and had a single battalion present at the battle. The version above have the same uniform as the men at Sedgemoor but carry the banners of William & Mary. 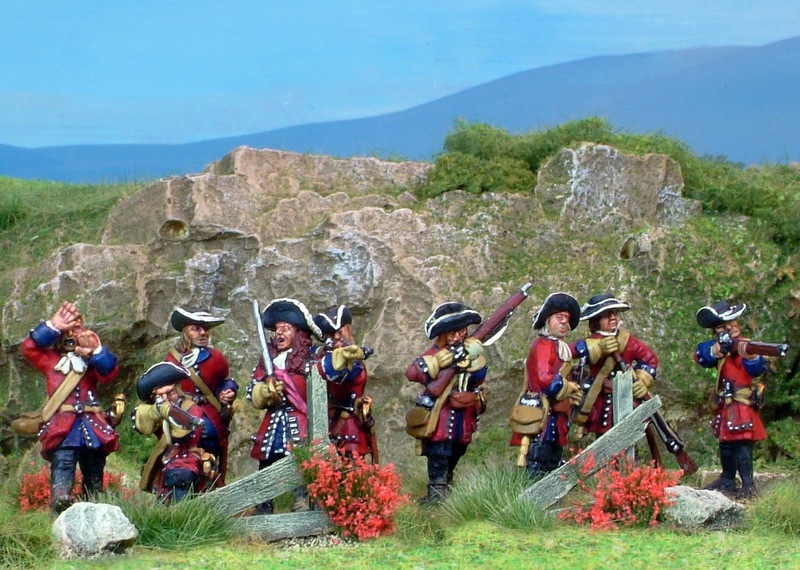 Dumbarton's Regiment (The 1st Foot, Royal Scots) was the oldest line regiment of the British Army. Interestingly, it was composed of Scots but sat on the English establishment. The regiment had seen service in Tangier and its lineage went back to the Thirty Years War. When the Glorious Revolution occurred it was one of the units which remained loyal to King James almost till the end. This version was painted in the late 1990s and is still part of my collection. 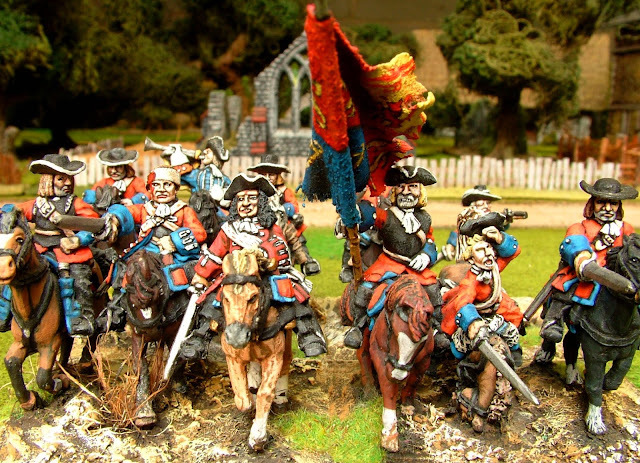 The commander of this regiment - Piercy Kirke is an inscrutable figure. An English born Scot, his life is a series of ambiguous scrapes and adventures with nebulous loyalties and conflicting acts which confounded almost everyone he served with or under. 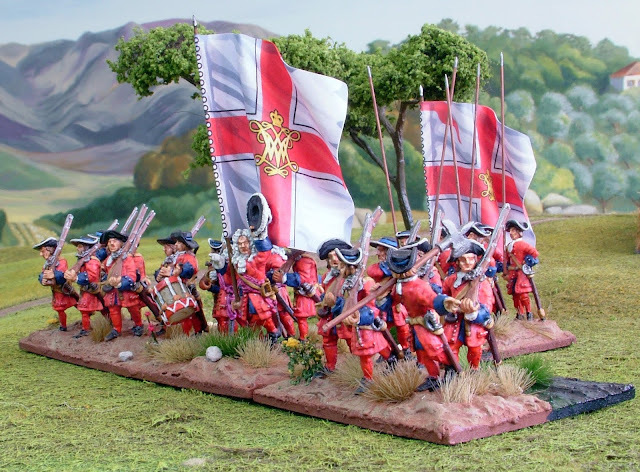 He was professional soldier and his regiment is held responsible for some of the brutality enacted on the West Country in the aftermath of the rebellion. It had five companies at the battle. 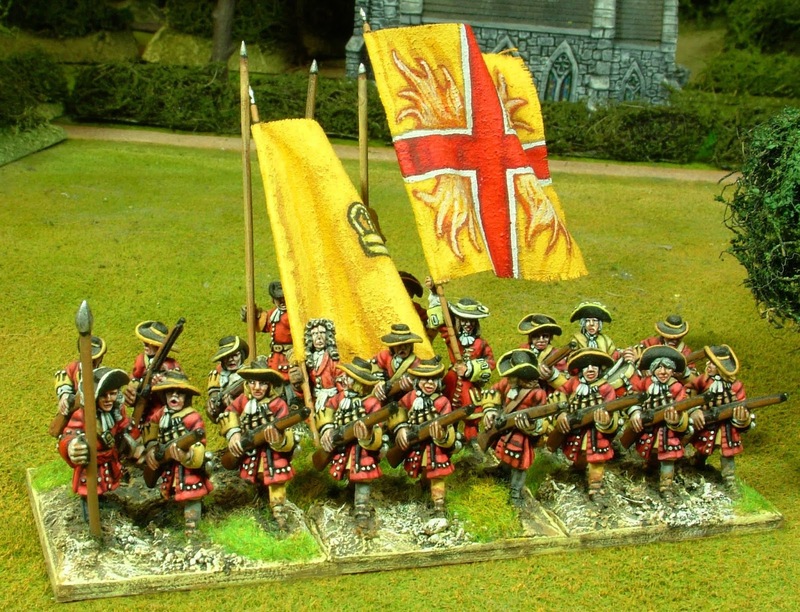 The version photographed above originally started out its gaming career as Montcashel's Regiment of the Irish Brigade in French service. I still have it although it have been re based and modified since this picture. 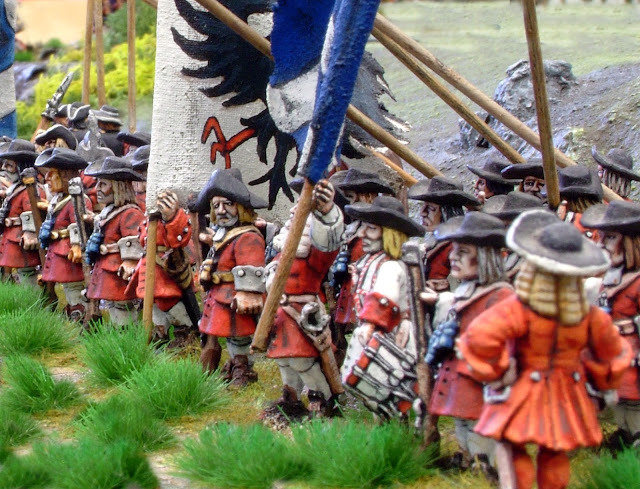 Trelawney's Regiment also had five companies at the battle. The version above was salvaged from a very badly painted job lot I bought on a bring and buy about 1992. I repainted them all and this unit stayed in my collection for about 10 years before I finally sold it. 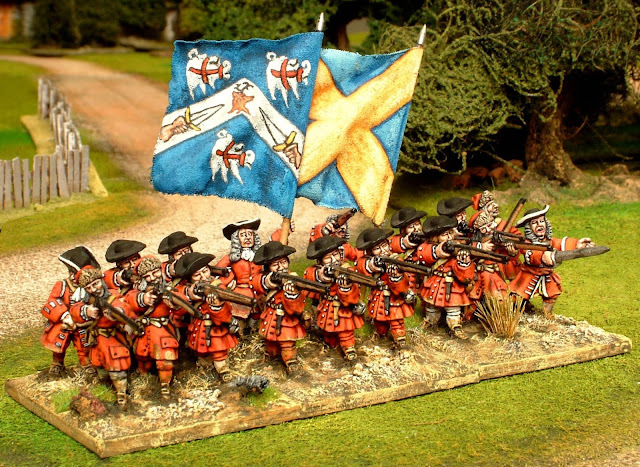 The three regiment Scots Brigade in Dutch service was recalled to England during the Sedgemoor campaign but did not see action. Ironic that the man who approved its transfer home was the same who would bring it over again in 1688 to take the crown from his uncle/father in law. The veriosn of Mackay's above was painted in about 1992 and I still have it. Originally, it had 36 models but I cannibalised it. 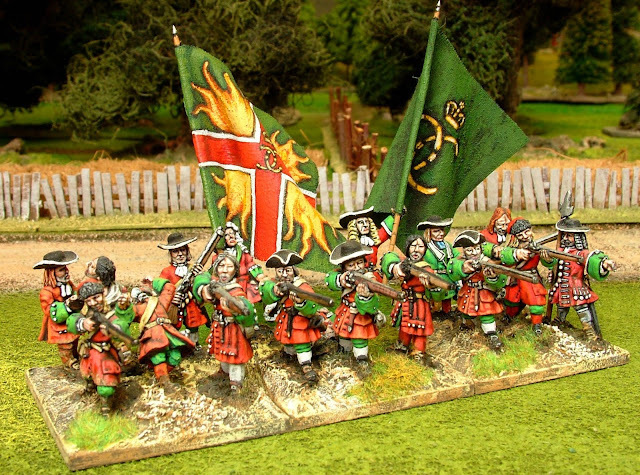 Ramsay's Regiment another of the Scots-Dutch brigade battalions. This, together with Mackay's and the third - Balfour's, were all cut to pieces at Killiecrankie in 1689. This unit was painted about 1993 and is still in my collection.